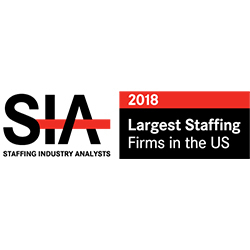 CHICAGO, IL – JULY 30, 2018 – Advanced Group has been recognized by Staffing Industry Analysts (SIA) as one of the largest staffing firms in the United States for 2018. The annual list ranked staffing firms with U.S. staffing revenue of more than $100 million in 2017. Advanced Group made the list reporting $151 million in staffing and talent engagement revenue. Advanced Group is a diversified professional staffing, consulting, and outsourcing organization with four businesses: Advanced Clinical, Advanced Resources, Advanced RPO, and WunderLand Group. Founded in 1988 and based in Chicago, IL, the company has over 450 employees in 17 offices internationally. Advanced Group places thousands of talented professionals each year in clinical research, HR, technology, finance, accounting, healthcare, office, marketing, and creative positions. The Advanced Group also offers RPO solutions. A total of 143 companies made this year’s list of the largest staffing firms in the U.S. Together these firms generated $83.6 billion in revenue, making up 58.6% of the market. The Advanced Group provides expertise in talent acquisition and management, consulting, outsourcing, and professional services. Founded in 1988, our businesses include Advanced Clinical, Advanced Resources, Advanced RPO, and the WunderLand Group. Awards we have won include Best of Staffing®, Chicago Tribune’s Top Workplaces, and inclusion on the Inc. 5000 list. To learn more, visit www.advancedgroup.com.